Everything about Annihilation, the sophomore film by writer-director Alex Garland following the enormous critical and awards success of his debut feature Ex Machina, is designed specifically for the big screen. The cinematography, production design, visual effects, and just about every other little detail from the tiniest hints within the acting to the intelligent and thoughtful screenplay, are all what cinemas are made for, and there really is no better place for it than in a giant auditorium with the best surround sound possible as well as other patrons seated all around you wanting the same theatrical experience as you want. The problem is, this wasn’t on the big screen. It was meant to be in cinemas, with Paramount planning a worldwide theatrical run outside of the United States around the end of February of this year, but then mere months before all of that, a fatal decision was made thanks to a spat between producers and distributors. You see, Paramount financier and the CEO and founder of co-distributor David Ellison was concerned that the movie would be, according to sources, “too intellectual” for audiences – keep in mind, this guy is also the producer of Terminator Genisys and Geostorm – and wanted severe changes to the ending of the film. Meanwhile, producer Scott Rudin sided with Garland’s vision and refused to alter the movie, which led to them turning to Netflix for a worldwide distribution instead, with Paramount just handling the theatrical release in the US and China. As a result, not only have audiences around most of the world, including here in the UK, been denied a cinema release for a movie that clearly belongs on the big screen, but a lot of them became quite angry about it when it debuted in the States to overwhelmingly positive reviews, many of which declared it to be a theatrical experience that needs to be seen on the biggest screen possible. I, for one, am extremely pissed off that I was forced to watch what is truly an outstanding movie on my tiny laptop screen as opposed to the much larger ones at the cinemas I usually go to; not even Curzon Cinemas decided to give it a limited theatrical run like they sometimes do with Netflix releases (oh, but God forbid others like Bright and Mute don’t get shown on those screens…), which means that unless one or two places somehow get the rights to show it at some point, Annihilation will be regarded by most people as a film that was just dumped unceremoniously on the streaming service, without a cinema release in this country or many others. Even though we Brits can’t go see Annihilation in the cinema as we really should, please do not let all that behind-the-scenes stuff cloud your judgement on this film, as no matter what format you watch it in, this is an outstanding piece of sci-fi that deserves a far bigger audience than it’s probably getting right now. It takes place after a mysterious anomaly known as “the shimmer” surrounds the landscapes of a Southern coast, with dozens of military troops entering it with not one of them coming back. That is, except for Kane (Oscar Isaac), who suddenly shows up to the shock of his wife Lena (Natalie Portman), a biologist, only for him to soon after fall violently ill. As Kane lays comatose, Lena becomes determined to find out what had happened to him in the shimmer, and volunteers to join a new all-female expedition with psychologist Ventress (Jennifer Jason Leigh), paramedic Anya (Gina Rodriguez), physicist Josie (Tessa Thompson) and geomorphologist Cass (Tuva Novotny), all of whom venture through the vastly mutating environment within the shimmer’s borders, towards a lighthouse they believe is where the anomaly originates from. With Ex Machina, Garland introduced himself as a filmmaker with vastly intelligent and suspenseful vision, being able to combine a spiritual and thought-provoking sci-fi tale with horror elements that made it far creepier than the majority of actual horror movies out at that time. 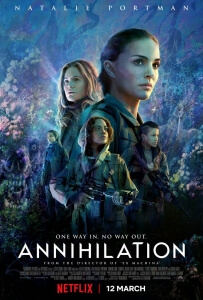 With Annihilation, he expands on that promise with deeply haunting visuals which may explore far more areas and environments than Ex Machina which was more confined to just the one location, but still manage to give you that same feeling of dread and claustrophobia as you venture around every corner of every abandoned building. There are scenes in this movie that are legitimately disturbing, from a piece of found-footage that indicates Oscar Isaac and his fellow teammates may have gone insane whilst in the shimmer, to an encounter with one of the many mutated animals that will send shivers down your spine once you realise what they can do, and like the rest of the movie they are both written and directed so strongly that you feel every bit of nervousness creep all over your body as you watch them unfold. Despite his background as a writer, Garland always lets the visuals speak for themselves and inserts dialogue whenever needed to lay out what is happening to the audience, but even then it never feels like it’s talking down to them and treats them with the same amount of intelligence as the main characters clearly share… unlike Ellison, who if he had his way would have ensured that would be the case. It’s filled with such vibrant and colourful atmosphere, boosted by the gorgeous cinematography and wonderful visual effects – although nothing comes quite as close to looking completely photo-realistic as robot Alicia Vikander in Ex Machina – and the actors all give strong performances in what is more of an ensemble film than it lets on. As a purely grounded sci-fi film, it’s one of the best of its kind since Arrival, and much like Denis Villeneuve’s equally astonishing movie it knows that the audience is smart enough to figure out the mind-bending mechanics of it all, without any of the climactic scenes not feeling out of place with the rest of the movie nor do they feel like they were added due to studio pressure (aside from a framing device which does feel at times like a requested insertion by those higher-up). If this were in any way shape or form playing in a cinema, I would highly recommend going out to see it because, if it’s this dazzling on the small screen then I can’t imagine what it must be like to witness in the way it really should have been. So, let this be a lesson in how you judge your audience, David Ellison; just because you think audiences are too stupid to understand a film like Annihilation doesn’t mean that they actually are, otherwise we’d all be clamouring for a sequel to Geostorm right about now, instead of praising what is easily one of the best movies to debut this year, no matter what format it may be in. Annihilation is an outstanding work of sci-fi art, one that sticks beautifully to its haunting and thoughtful tone all throughout due to writer-director Alex Garland’s bold creative force – though I imagine it would have been even better seeing this on the big screen.